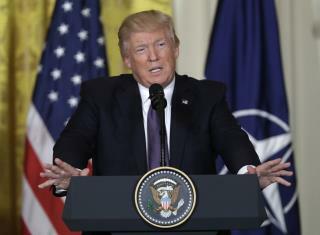 (Newser) – In one of several policy shifts Wednesday, President Trump cemented his change in posture toward NATO as he stood alongside the 28-nation military alliance's leader at the White House. As a candidate, Trump had dismissed NATO as "obsolete," saying the post-World War II organization wasn't focused on combating the growing threat from terrorism and complaining that too many members weren't paying their fair share toward defense, the AP reports. He struck an entirely different tone Wednesday, one he had been warming up to during frequent telephone conversations with his world counterparts. Trump is like a ten year old who talks sh1t about people and then cowers when he actually meets them. This started with his meeting with the Mexican president when he was utterly silent about his bullth1t "wall" in the guy's presence after jawjacking about the guy for months. He bloviated against Angela Merkel over and over, then couldn't even look her in the eye when he was sitting right next to her. He RAILED on and on about "JYNa" the whole campaign, and then turns into a wuss when they show up. Now, with the head of N.A.T.O. standing in front of him, he reverses course aGAIN, and suddenly N.A.T.O. is no longer "obsolete." He's gonna be known as "Hairpin Donny" if he keeps running away from the people he's been charging at. There is absolutely nothing that this guy campaign on that he hasn't reversed position on. What Trump really meant was, "I was ignorant and clearly in over my head but now I am slightly less so".